Achilles is considered by many scholars to be the greatest ancient warrior, who showed his courage and skill on the battlefield countless times. During the Trojan War, he alone killed multitudes of Trojans, as well as their most fierce allies. The perfect hero on the battlefield, Achilles had a lot of shortcomings as well. His impulsive character led him to ignore the advice and counsel of others. His tremendous pride caused him to abandon his Greek comrades and quit the war because he felt insulted. His explosive anger and bloodthirstiness led him to desecrate the body of his most heroic adversary, Hector. Achilles was the son of Peleus, the king of Phthia, a city in Thessaly (northeastern Greece) and Thetis, a goddess of the sea. Peleus himself had quite an adventurous life, before becoming husband of Thetis. Being the son of Aeacus, king on the island of Aegina, he and his brother Telamon were banished from the island by their father, when they accidentally killed their half brother Phocus. While Telamon migrated to the island of Salamis where he later became a king, Peleus headed for Thessaly to Phthia, where the local king Eurytion welcomed him and later offered his guest the hand of his daughter, Antigone. 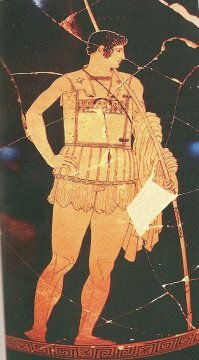 Unfortunately, Peleus's life in Phthia was destined to end abruptly, when he accidentally killed his father-in-law during a hunting trip. After fleeing Phthia, Peleus sought refuge in Iolcus, where he was invited by his fellow Argonaut Acastus, who was the local king. However, misfortune hit him there as well. Astydameia, the king's wife, fell in love with Peleus and when he did not yield to her advances, she claimed to her husband that his guest friend had violated her. Acastus, feeling betrayed by his friend, came up with a scheme to have him killed : He arranged a hunting contest and invited Peleus to join. At night, when Peleus was exhausted and fell asleep, Acastus stole his sword and abandoned Peleus in the woods, hoping that the barbarous Centaurs would find him and kill him. But, Peleus was lucky enough to be found first by Cheiron, the wise centaur who was living on Mount Pelion, who saved him and returned to him his sword. Being saved, Peleus later returned to Iolcus with an army and killed Astydameia to punish her for her treachery. The hero's mother was Thetis, who was one of the Nereids, daughter of old sea god Nereus and the sea goddess Doris. As the myth goes, god Zeus had courted Thetis. But, when she became pregnant, he found out from Prometheus that the son she would give birth to, was destined to become greater than his father. Fearing that he would suffer the same fate as his own father when he overthrew him, the almighty god decided that Thetis would not marry any god. So, he chose Peleus to be her future husband. In the meantime, Peleus's first wife Antigone had killed herself, unable to bear the fact that her husband had cheated on her with Acastus's wife. The wedding between Thetis and Peleus was one of the most well known in Greek Mythology. All the gods and goddesses were invited, honoring the glamorous couple with a lot of presents.Thetis received a magnificent jeweled crown from Aprodite. To Peleus, the gods brought two immortal horses, Xanthus and Balius. The only goddess not invited, for obvious reasons of course, was Eris, the goddess of discord and strife. When she tried to crash the party and was still refused admittance, she used the Golden Apple to spark a rivalry between three goddesses (Aphrodite, Athena and Hera). More than a decade later, this rivalry would escalate to the outbreak of the Trojan War. When Achilles was born, his mother was not content to have a mere mortal as a son. So, she set her mind on turning her son into an immortal. Inspired by the hero Hercules who burned off his mortality on a funeral pyre while his immortal part rose to Mount Olympus, she tried to do the same to her son, by anointing him with ambrosia during the day and dipping him in a pot of boiling water during the night, holding him only by his heels. 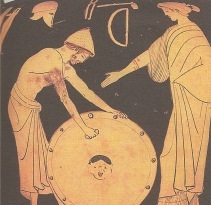 However, when Peleus witnessed the horrible ritual one night, he quickly pulled his son out of the pot. Thetis, insulted by her husband's action, she abandoned both Peleus and her son and returned to the sea. According to another version, instead of boiling water, Thetis dipped her baby in the waters of river Styx. Through both versions, the hero achieved immortality in all of his body, except his heels, which were held by his mother during the ritual. Being a single father, Peleus gave his son to the wise centaur and old friend Cheiron, to rear and train him. As a matter of fact, it was Cheiron who gave the boy his name, Achilles. The hero was taught the art of war and soon showed his great potential. Indeed, he was said to be so strong and fast, that he could easily outrun a deer. After his initial training finished, the hero returned to his father in Phthia, who entrusted him to his friend Phoenix, king of Dolopians, to take over the rest of his training. 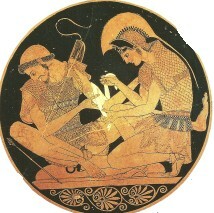 While studying under Phoenix, Achilles met Patroclus, the son of Menoetius. Soon, the two boys became close friends and, according to some of the ancient storytellers (with the notable exception of Homer who never claimed such a case), possibly lovers. The renowned seer Calchas was one of the first to recognize the hero's great potential. When the boy was just nine years old, he prophesized that the Greeks would never take Troy without him. Thetis, knowing that her son was destined to die if he fought in the Trojan War, devised a scheme to keep him from joining the rest of the Greeks, in their campaign against Troy: She disguised him as a girl and sent him to the Aegean island of Scyrus, to live among the daughters of king Lycomedes. He laid down a spear and a sword and next to them he placed a number of pretty jewels. He then invited all the king's daughters to play with the jewels. 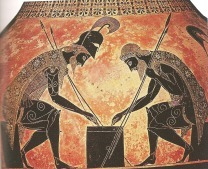 While they were playing, one member of Odysseus's crew, acting under his master's directions, sounded a horn, indicating a false alarm that they were under attack. The trick worked: The disguised hero, as soon as he heard the call, took off his lady garments and lifted the spear and the shield from the floor, ready to fight! Despite his mother's pleas not to go to war, Achilles was finally persuaded to follow Odysseus. As a matter of fact, his mother confided in her son that if he remained at home in Phthia, he would have a long, safe and comfortable life, while if he went to Troy he would have a short, dangerous, but glorious one. Achilles, being a true hero, did not hesistate to choose the latter. When they joined the Greek fleet in Aulis, the hero, despite his young age, was appointed an admiral by Agamemnon. He would lead an army of Myrmidons, or "ant-people", who had migrated to Phthia with Peleus when he was banished from Aegina by his father. Before attacking Troy, the Greeks first attacked the island of Tenedos. Ignoring his mother's warnings, the hero killed king Thenes, a son of Apollo, who tried to prevent the invaders from coming ashore, by pelting them with heavy stones. As the story about the war later turned out, Apollo was so infuriated with his son's death, that he arranged for Achilles's death. From very early in the war, Achilles established himself as a mighty warrior. As the myth goes, one of his first victims wasCycnus, son of the god Poseidon.When Cycnus died, his father transformed him into a swan. In the Hypoplacian Thebes, the warrior hero killed king Etion, who was the father of Andromache, wife of Trojan hero Hector, as well as his seven sons. The hero honored the king for his bravery by awarding him a full funeral and burial in his armor, but held his wife, Hector's mother in law, for ransom. He ambushed and killed Troilus and captured Isus and Antiphus, while they were attending sheep on Mount Ida. He also captured Lycaon, while the boy was cutting fig shoots to make rims for his chariot wheels and later sold him as a slave. In one of the numerous Greek attacks on Troy, the hero managed to abduct a young beauty by the name of Briseis, to serve as his concubine. Meanwhile, Agamemnon, the commander in chief of the Greek army, enslaved a concubine of his own on the island of Chryse by the name of Chryseis, who was the daughter of the island's priest of god Apollo. Devastated by his loss, the girl's father pleaded the god to send a pestilence on the Greeks. As a result, both animals and men began dying on the Greek camp. Having no other option, Agamemnon had to surrended the girl back to her father, in order for the curse to be lifted. However, to compensate for his loss, he ordered Achilles to give him Briseis. Infuriated, the hero vowed to remain in his tent and refused to fight. In addition, his mother Thetis who kept on her beloved son a close watch since he joined the Greeks, pleaded with almighty Zeus to deny the Greeks any victories on the battlefield, until they begged her son to return to them. Zeus agreed and as a consequence, the Greeks began to suffer a lot of setbacks. Hector, commander in Chief of the Trojan army, led an assault which pushed the Greeks back all the way to the shoreline, where there ships were docked,and set them on fire. Several attempts to appease the angry Achilles and convince him to return to the battle all failed. Even promises not only to return Briseis but also to hand him a substantial amount of gold, were not successful. Finally, he agreed to lend his armor to his friend Patroclus who would enter the battlefield, in an attempt to misguide the Trojans that he himself had returned. Unfortunately, however, Patroclus would soon suffer a violent death in the hands of Hector. Embittered by the loss of his beloved friend, the hero decided to return to the battlefield, wearing a brand new armor which was forged by god Hephaestus, following a request by Thetis. Entering the battlefield with a renewed vigor, the hero single handedly spread terror and death to thousands of Trojans, whom he tossed into the river Scamander. As a matter of fact, the river was so full of corpses, that he rose up against the hero, flooding the plain where he fought. God Hephaestus, however, saved him from drowning by drying up the river with a single, tremendous flame. After Achilles forced his opponents to retreat inside the city's walls, Hector alone came out to challenge him on the battlefield. Being overpowered by a much superior opponent, the Trojan hero was finally chased and killed. Not able to contain his rage, Achilles then desecrated Hector's body, dragging the corpse behind his chariot and circling the walls of Troy three times. After retreating to his tent carrying with him the dead body of his challenger, he finally succumbed to both the pleas of his mother and the old Trojan king Priam, to surrender the body for burial. Still after the death of Hector, Achilles remained a formidable warrior, overpowering the trojan army. He even defeated and killed the queen of Amazons, Penthesileia, when she came to assist the desperate Trojans. As the myth goes, the amazon queen was so beautiful, that the hero fell in love with her when he looked at her and wept, when he stripped her corpse of her armor. Disgusted with himself being responsible for the death of so many human beings, the hero took a leave from fighting and traveled to the island of Lesbos, where he made sacrifices to Apollo, Artemis and their mother Leto. Upon his return, the hero finally met his tragic fate: From inside the walls of Troy, Paris, assisted by god Apollo, shot an arrow that fatally pierced the hero's vulnerable heel. In honor of their great hero, the Greeks constructed a funeral pyre, where they burned his corpse. After that, Thetis accompanied by her 49 sisters arose from the sea and collected her beloved son's ashes in a golden urn, where she mixed them with the ashes of her son's friend and lover Patroclus. She then disappeared back into the sea.